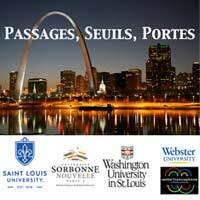 Lionel Cuillé, the Jane and Bruce Robert Chair in French and Francophone Studies in Webster University’s College of Arts & Sciences, is the lead organizer for Passages, Seuils, Portes, the annual international conference in French and Francophone Studies, to be held March 17-19 at the Hilton St. Louis at the Ballpark. Other conference organizers include Pascal Ifri, Washington University; Jean-Louis Pautrot, Saint Louis University; and Olivier Penot-Lacassagne, Université Sorbonne Nouvelle. Cuillé drafted the call for submissions and chose “gates” for this year’s conference theme. “I started from our city’s [St. Louis] symbol, the Gateway Arch,” he said. “I needed a relevant theme which could be relevant for all Francophone scholars, coming from Europe and Africa. “It is great that Webster and the French section in International Languages and Cultures (ILC) is represented during such a major event,” said Cuillé. 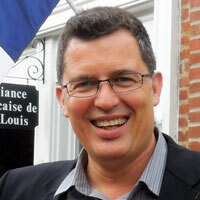 Lionel Cuillé was named the College of Arts & Sciences’ inaugural Jane and Bruce Robert Professor of French and Francophone Studies, in August 2012. Cuillé holds a doctorate in Literature and the Arts from the prestigious E.N.S in Lettres et Sciences Humaines (Lyon) where he co-directed the Centre d’Etudes Poétiques. His area of specialization is 19th-21st century French literature. In 2012, he created the Centre Francophone at Webster, which promotes Francophone culture in the St Louis area. The Jane and Bruce Robert Professorship in French and Francophone Studies was made possible by a generous gift from the Roberts, which established Webster University’s first endowed professorship. Jane Robert ’69 is highly regarded locally, nationally and internationally as an advocate for the study of French. She currently serves on the Webster University Board of Trustees. Jane Robert has received numerous honors and awards for her advocacy work, including the French government’s knighthood known as “Chevalier dans l’Ordre des Palmes Académiques” in 1998 and the French Legion of Honor in 2007, which is the highest distinction awarded by the French government.